The sound of our footsteps is muffled by patchwork drifts of snow on a gravel track winding past the bottom of carpark stairs. Surrounding hills are covered in local rhododendron; the air icy, the trees tall, rough barked and bare. Our guide strides ahead – rugged-up for the 10min walk – black puffer coat full length, fur trim sleeves and hood. She stops, adjusts her mittens and points her umbrella. There’s a gap in the trees, and the house appears on cue among flurries of snowflakes that float to rest on a leaf-littered forest floor. Brenda is a local, and long-time disciple of the American architect Frank Lloyd Wright. And we’re at Fallingwater, Wright’s iconic creation, 70km southeast of Pittsburgh and now a monument to the architect’s base philosophy – `Usonian’ design – organic architecture in harmony with humanity and the environment. US architects voted this house the ‘best all time work of American architecture’. From a southern Melbourne summer, I’ve flown to NYC with my girlfriend, our aim to first see Wright’s Guggenheim Museum. From the beginning of 5th Avenue we’ve ambled northwards through city environs reminiscent of Paris, along an avenue part Gothic and part Renaissance before morphing into a New York that Wright called ‘…an affected riot’ and a `… monument to the power of money and greed…’; then finally onwards to the Guggenheim which opened the year of Wright’s death. Turning my gaze across 5th Avenue I’ve admired the simple wilds of Central Park; its brooding blanket of fine powder snow and the bones of bereft trees. A squirrel jumps and props at the kerb, red-grey tail arched above the white. Finally at Fallingwater we’re now standing on the causeway bridge – Brenda, my girlfriend and I – Bear Run stream gurgling below us, the house a series of miraculously cantilevered concrete tiers over rocky outcrops and white water. Brenda waits as we hang our coats inside. Narrow stairs and passages meander cave-like and indicative of Wright’s approach; thick walls of local sandstone. In the living room, a giant boulder is part of the hearth, the ceilings low; my eyes drawn to the winter wilderness outside. The windows are clear, mitred glass with no cornice or frames to obstruct the view. From the centre of the room Brenda waves a hand towards horizontal sliding panels of glass; an enclosed stairwell leading down to the babbling stream below. “The panels of course are sliding, and can be opened in summer to admit water- cooled breezes.” It takes me a moment to absorb the significance of Wright’s radical 1939 design, and I find it difficult to imagine such an innovative architect with little work when commissioned by the Kaufmans to design this place. But Wright’s life was anything but ordinary. Even before Wright’s birth in 1867, his mother declared her son would `grow up to build beautiful buildings.’ The young Wright himself would claim he would `be the greatest architect of all time’. His first marriage at 21yrs old, to Catherine Tobin, gave him the social connections he needed. As a Chicago architect there was success blending buildings with landscape, before his designs became more experimental. By 1907 he was challenging the moral majority with his long hair, broad-brimmed hats, red-lined cape and cane. There were also joyrides with married women in his luxurious open car; his exploits culminating with Wright leaving for Europe with Mamah Cheney, a client’s wife. He left his practice, his six and her two children behind. Wright would return to build Taliesin in the Wisconsin wilderness, a melding of his organic theories and an isolated citadel to ride out the public storm with Cheney. With his fall from favour, there would be few commissions for 20yrs. Worse was yet to come, with Wright taking 10yrs to recover from the personal devastation that followed. While working at his Chicago office in 1914, now age 47, a servant bolted doors and poured petrol on the floor of Taliesin, attacking the occupants inside with an axe and hunting down those trying to escape. Taliesin was razed to the ground, with seven murdered including Cheney and her two children. Wright buried Cheney in a simple grave and began work on Taliesin 2. Sailing to Japan in 1916 with the bohemian clairvoyant Mariam Noel, he opened an office in Tokyo. With Wright’s divorce from his first wife he entered into a volatile marriage with Noel, only to see it disintegrate with her opium addiction. Next Wright met Montenegrin dancer Olgivanna Milanoff in 1924 at the Petrograd Ballet in Chicago. While dealing with a messy divorce from Noel, Wright saw yet another fire; this time destroying Taliesin 2. Wright again rebuilt and re-married, only to suffer a bout of pneumonia. It was Milanoff who convinced Wright to finally leave Wisconsin for the sun and pure air of Arizona. 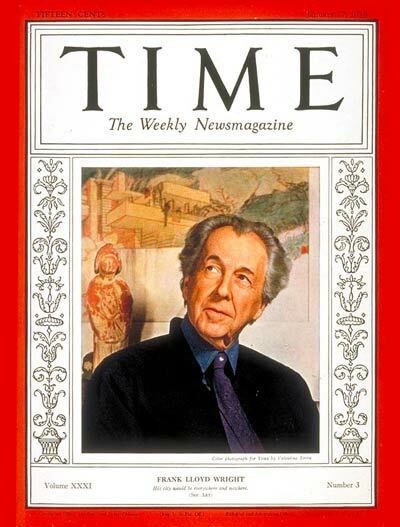 With Milanoff, Wright’s luck improved; the architect appearing on the cover of Time magazine. From here till his death, Wright was a celebrity of radio, film and TV; although labelling the latter `chewing gum for the eyes’. Fallingwater was completed in 1939, followed by Taliesin West: becoming his Arizona home and architectural studio. 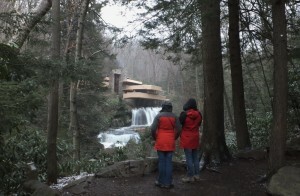 We’ve completed Brenda’s Fallingwater tour, standing by a low bench at a bend downstream and peering back to the house; through a silent forest, now bathed in weak streaks of sun and flurries of winter snow. We exchange glances; my girlfriend an aspiring architecture student in earlier times. Does it live up to expectations I wonder? I see the house as a transported Shinto vision of rural splendour ; Bear Run stream tumbling and winding towards us from beneath Wright’s radically-cantilevered terraces that seem to float 10m above the gurgle and rush of the water gods. We’re pondering the lot of Wright, dying in 1959 and his ashes now in far-off Arizona at Taliesin West; interred alongside those of his last wife Milanoff, at the headquarters of the Frank Lloyd Wright Foundation. We both fall silent and gaze about us; the wet forest sentinels, the damp rolling hills, the hypnotic serenity of Fallingwater. I’m thinking, yes, the whole place is the epitome of the man’s philosophy: `Buildings, too, are children of Earth and Sun’. I always love reading your blog posts as your wonderfully descriptive yet personal style of writing makes me feel like I am traveling with you around the world. Good to here from you, & I trust all’s well with work & life. Thank you so much for the very welcome compliment. Great piece Ian. I never knew Wright’s life was that eventful. A bit too hectic; but I guess he had the self-confidence to get through. Wow, what a great story Ian, I’ve always loved Lloyd-Wright’s work and this was a fascinating insight into his life. Thanks for a top post. Yes, there are so many of us that have an appreciation of his work; but he did well to overcome some horrid setbacks. Ian, great post. Fallingwater is a stunning piece of architecture. Frank Lloyd Wright had incredible vision and there is really nothing else like it. Thank you for your wonderful descriptions and photos. I appreciated the historical background too. Fascinating that his mother foresaw his potential before he was even born. I’ve seen documentaries on Wright and knew to some extent about his devastating personal tragedies, marriages and divorces. He had such a resilient spirit that refused to quit and that’s something I admire. And he was truly an architectural master. I believe I agree with your girlfriend’s assessment that one could imagine Wright’s broken heart in the charred ruins of Taliesin 1, but his heart is really there at Fallingwater. “Buildings, too, are children of Earth and Sun.” I love that quote by Wright and yes, indeed, they are. Thanks so much Michelle. Very kind. Commuting towards office, I’d notice the new entry at your blog and instead of poring into my phone I saved it for a leisurely read at evening. As always, your writing quickly ushered in an intimacy and established the surroundings swiftly, as if I were accompanying you and others to Fallingwaters. I must say, Ian, I stand enlightened, even if dismayed, by that brief yet pointed history of F L Wright. Thanks for sharing. Thanks for keeping my story up your sleeve for a leisurely read. Your comments are, as always, much appreciated. A man obsessed by his work, his vision, as I suppose, such people must be. He weathered many a storm and a tumultuous personal life to be the artist he became. As always, Ian, I enjoyed your amazing gift for precise and vivid detail. From what I understand, he never seemed to suffer from any self-doubt. Supremely confident in his own mission in life. Wow! I had no idea Wright had such a wild life. I love his work but am not sure I’d have liked the man. The beauty of his designs is captivating, though. He truly was a mad genius. I guess I’ve always admired his work from afar; so it was quite an experience to see his work in person. Ian, I’ve never heard much about Wright’s personal history; thanks for illuminating me. I’ve always loved his work. A giant on the world stage to be sure. Finally recognised late in life. what i really appreciate about Wright is his passion for simplicity and functionality, especially in simple and functional spaces, like hallways. With today’s over-saturated home decorating media, it’s refreshing to see something made to be from a master with now fireworks. I too liked his simple but visionary design; hard to believe it was so long ago. & yes, you being a cook, would have appreciated the story of the Kentuck Knob kitchen – yes, we have also shared that path. I think if Wright have got his way with that layout, it would have been far too small & most likely unworkkable from what I saw. I did love everything about Kentuck Knob. Appreciate the comments, & it seems we share a passion for architecture as well as cooking – me an avid eater & you a creator. what a magical journey. We made this trip two Septmembers ago, and also had the opportunity to visit Kentuck Knob. I swear, we could live in that area. It’s so gorgeous and unspoiled. We took and interesting cave tour as well. With you being so well-traveled, I find it quite cool that we both walked the same ground. If you are still in the area, check out Kentuck Knob, and the once in a lifetime tour of an impressive sculpture garden. I surprised myself by loving F L Wright’s domestic architecture in Chicago and Fallingwater….I had expected it to be too modern and too prairie-ish for my taste. But he really was a difficult architect to work with. He bullied the owners of each site untl he got what HE wanted, not what the owners needed. Certainly an architect needs a vision, but he will never see the house again. The owners will have to live there for 30 years. Yes Hels, it does seem he was a `difficult’ man; & from what I know did seem to bully his clients. I don’t think he’s alone on that point. I did hear a story while there, that Mrs Kaufman wanted her own furniture & not all of that proposed by Wright. I believe she had to move it out of sight whenever he visited.